in Darmstadt near Frankfurt, Europe. The conference takes place in the Darmstadtium. Come on 29 and 30 October and experience the comprehensive potential of RFID & Wireless IoT. The evening event on October 29 is the ideal opportunity for productive networking in a relaxed atmosphere. With increased exhibition space and a proven conference concept, the congress continues on the road to success! Come to darmstadtium on 29 and 30 October and experience the full-featured potential of RFID & Wireless IoT in your business. 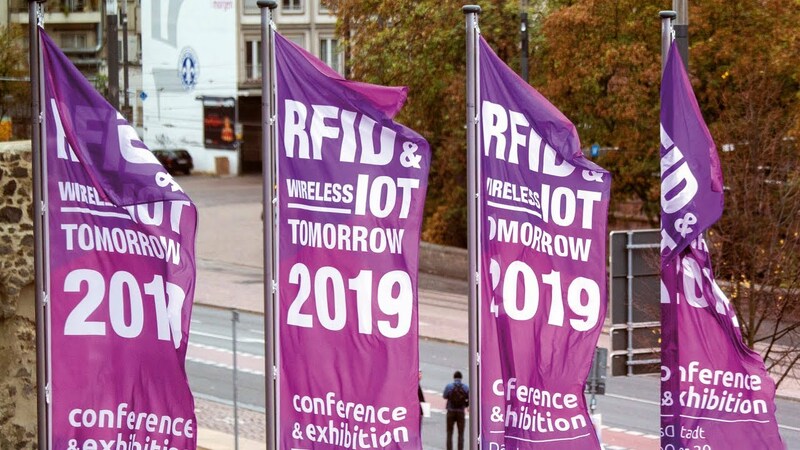 After last year’s highly successful installment of RFID & Wireless IoT tomorrow in Darmstadt, the organisational team prepares for even higher numbers of visitors and exhibitors. The Trade Show in 2019 will set new standards – and with around 80 companies, it will be more comprehensive than in any previous year. Anyone looking for technology and the right contacts will find what they are looking for here. In 2019, the conference programme on Day 1 will focus on four specialist forums. For each forum, eight proven experts will present their know-how and exclusive insights. Two forums each on use cases and two forums on technology topics create the perfect all-round package for the best gain in knowledge. Conference Day 2 brings three use case topics straight to the stages. Two technology forums will join them to create a knowledge atmosphere that is second to none. Hardware, software, integration and best practice examples - everything for the digital future of your company. Leading position in Europe expanded! 1,000 technology experts, scientists and users from almost all parts of the world met at Europe's largest event for wireless IoT technologies and applications! The congress continues the successful development of the previous seven years seamlessly. In all areas – participants, exhibitors, forums – significant growth was relised. The fact that the event has developed a reputation far beyond the borders of the DACH region is underlined by the fact that almost 60 percent of the participants are international. New RAIN RFID Reader With Innovative Connection Concept With the new ARU 2400, Kathrein Solutions is launching a RAIN RFID reader on the market that is as easy to install as it is to operate! With its slim, smart design, durability and functionality, the reader can be used in a variety of applications. The powerful RAIN RFID interface known from Kathrein and the robust design are also present in this 27-dBm class reader. World premiere: Kathrein will present the ARU 2400 for the very first time at the RFID & Wireless IoT Tomorrow 2018 on October 30 & 31 in Darmstadt near Frankfurt, Germany! RFID & RTLS from a Global Market Leader. Dieter Horst, Head of Product Management, Simatic ident / Siemens, shows modern ways of enabling Industry 4.0 with RTLS, Digital Twins and more! Siemens is supporting RFID & Wireless IoT tomorrow since the early days as partner and sponsor. Take the chance and come to Darmstadt on 30 October to the RFID & Wireless IoT tomorrow. Follow the lecture by the industry leader and get in touch with Dieter Horst. Representatives from Nigerian business and politics open the way for sustainable business development at the RFID & Wireless IoT tomorrow. Africa’s biggest national economy is in search for RFID experts, technologies and know-how at the RFID and Wireless IoT tomorrow 2018! The Nigerian mineral oil industry counts on international expertise for urgent IoT solutions in production and logistics. Small and mid-sized Nigerian businesses present business options for system integrators and technology providers. The business field of growing information and communication technology in Nigeria is the perfect surrounding for new business areas for companies from around the world! Join the conference on October 30-31, and meet the technology experts and representatives from Nigeria.